Some years before John Quincy Adams (1767 – 1848) became 6th President of the United States, he acted as its representative in London between 1815-1817. 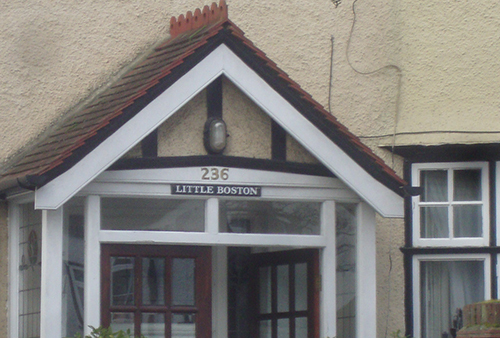 Instead of organising digs in town, he moved his family into a country house in “Little Ealing” an area in the south of the borough: a road in which I too have lived since 1987. I had no idea until a local history group published a book based on Adams’s diary entries of the period. An American President in Ealing is an excellent work of local and social history. I was interested to discover that Adams enjoyed walking to and from his office in Craven Street near Charing Cross. Coincidentally, Benjamin Franklin had lived in the the same street over fifty years previously when he had represented the colonies of Pennsylvania and Maryland. Adams was quite specific about his walks. He claims that his best time was two hours and 20 minutes, achieved at over 4 miles per hour. He mentions passing Gunnersbury Mansion, Turnham Green, Hyde Park Corner and St James’s Park. Using this information and an 1800 map, I traced a probable route. John Quincy Adams’s probable route from Little Boston House to Craven Street. Yesterday morning, armed with our 1800 map, a modern A-Z of London, bananas and water, Fiona and I walked up the road to our starting point, a house on the site of the original Little Boston House. The present owners are clearly aware of the provenance of the site. A lengthy walk. 9.4 miles according to our GPS app. We did a coffee stop in Chiswick and a banana stop outside the V&A. We also did some unscheduled browsing at Chiswick auctions where I shot this picture. It’s what Hyde Park Corner would have looked like as Adams passed through. 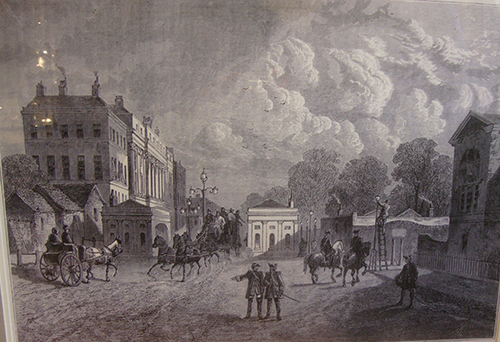 Hyde Park Corner in 1800, the exact time of our map and only a few years prior to Adams’s walks. Through Admiralty Arch, past Northumberland Avenue (both long after Adams’s time), into the Strand and a final right hand turn into Craven Street. Check watch. Four and a half hours. Almost double the time claimed by the fleet-of-foot future president, then. If we take off say 60 minutes for our stops, our taking photos, our stuck at the lights waiting for the green man (there was a lot of this), we’re still substantially slower than Adams. 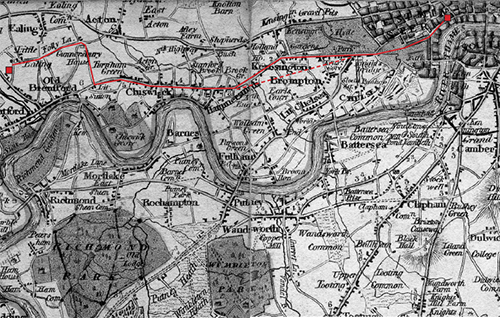 He may have taken short-cuts which we avoided, for example through Gunnersbury Park (Would he have had a right of way? I think he must have). Further taking into account our advantages of modern footwear and paved surfaces, Adams must’ve put his head down and gone and quite a lick, very much a fast walk or jog almost. 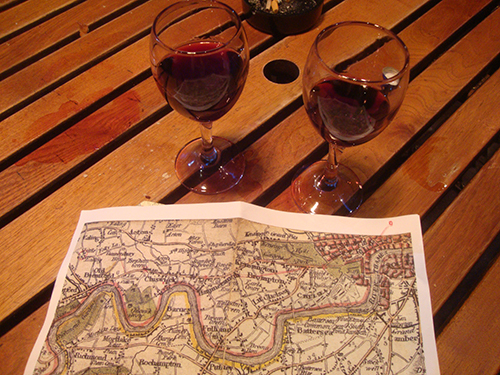 With achy limbs and feet, our odyssey was wrapped up with several glasses of excellent merlot at the wonderful Gordon’s Wine Bar, a favourite. Other known walkers from country to town and vice-versa include William Hogarth (Chiswick – Leicester Fields (ie Square)) and Sir John Soane (Ealing to Lincoln’s Inn Fields (i.e. today’s John Soane Museum)). We’ll cover those in due course. John and Louisa Adams had married in London in 1897. You can see the actual page of the marriage register in the excellent crypt museum at All Hallows by the Tower. Marriage register at All Hallows by the Tower. 26 July 1797. 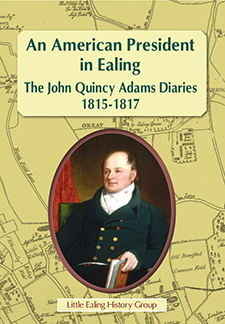 An American President in Ealing, the John Quincy Adams Diaries 1815 – 1817 is published by the Little Ealing History Group. 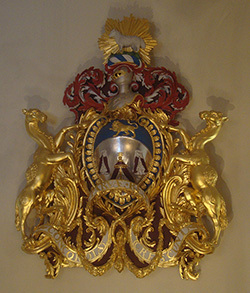 Review of our beadle-led visit to Merchant Taylors’ Hall: a guest post by London Historians Member Steve Cook. 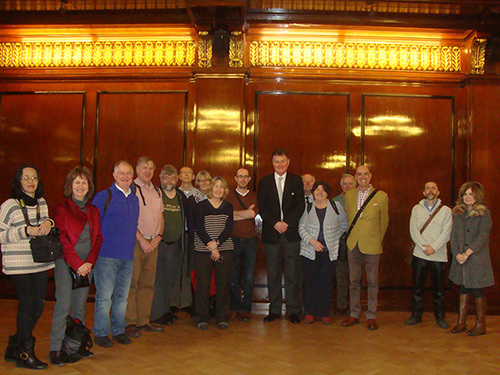 It was a cold day but a warm welcome from Beadle Kevin McGetrick at Merchant Taylors’ Hall on Friday 16th January. 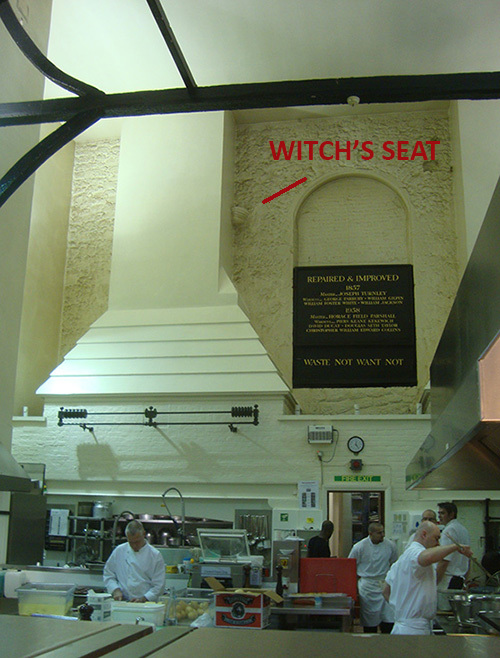 The Hall has occupied the same site on Threadneedle Street since 1397 and – despite the Great Fire and the Blitz – still boasts its original medieval stone walls, most clearly visible in the spectacular double height kitchens (definitely up to modern catering standards but still essentially medieval, complete with a witch’s seat) and again in the crypt of St. Martin Outwich beneath the beadle’s office. On the walls of the reception area are two ‘Pall Clothes’, last used at the time of the Stuarts to cover the coffin at a Master’s funeral. Irreplaceable and therefore priceless, but still insured for £100 thousand apiece. Funeral pall cloth. Over 400 years old. 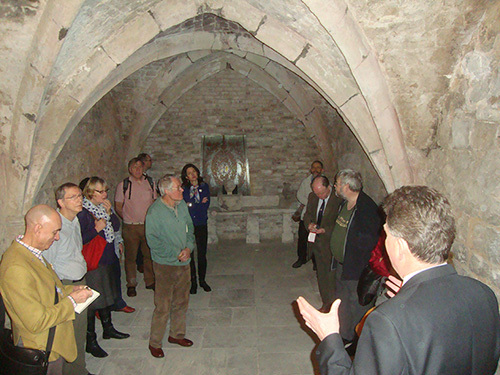 Like the company itself, the hall has undergone many changes since its medieval foundation. 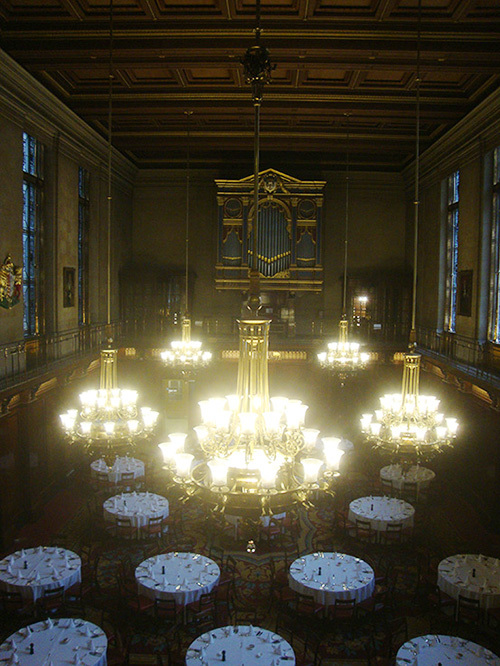 The magnificent Dining Hall, Parlour and Drawing Room are part of the post-war reconstruction. The Dining Hall is still the same structure as it was before the Great Fire and the mahogany panelling that conceals the medieval stonework is said to have been obtained immediately after the war – at very reasonable rates – from the Bank of England. 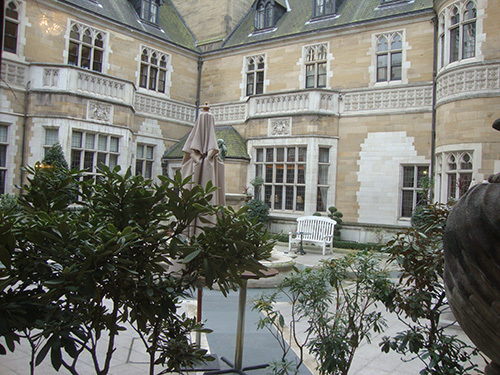 (Between them Peter Twist and the Beadle concluded that it is probably the taller than any other livery company’s dining hall!). Despite its height, the hall is overlooked by the King’s Gallery, named for James I who was kept separate from his subjects below, either to save him from the smell of them [vice-versa probably! – Ed], or to protect them from the sight of James trying to eat around his over-sized tongue. Either way, the Gallery was subsequently glazed so that the occupants could see – and be seen by – the diners below. The Dining Hall from the Kng’s Gallery. 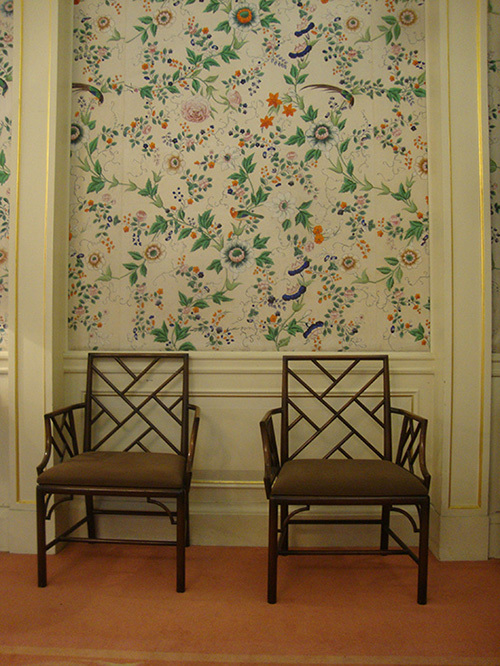 The 18th-century Chinese wallpaper in the Drawing Room was purchased at auction in 1957, still in its original export boxes! Ingeniously, it isn’t pasted onto the walls but mounted on removable panels. The cloister was enclosed as recently as 1927, without apparent detriment to the delightful courtyard it surrounds. It is thought that there have been no working tailors in membership since the end of the 17th century. The Company is now a social and charitable organisation with a powerful interest in education. Merchant Taylors’ School, founded in 1561 by Richard Hilles, Master of the Company, now a fee-paying public school educating 800 boys is the best-known foundation; but the Company also has interests in schools in Crosby, Wallingford, Ashwell, Wolverhampton, Foyle and Edinburgh. The charities that currently enjoy support from the Company continue the education theme: Killforce which uses ex-military instructors and largely practical training exercises to help students attain recognised qualifications; Westside School an ‘Alternative Provision Free School’ for young people excluded from a mainstream school or who are at risk of exclusion; support for the bursary programme at Pembroke College Cambridge; and XLP, a Church of England based youth project that works right in the heart of some of the most divided communities in Inner London. At the end of our tour there was little to do other than thank Kevin, Mike and Augusta; and reflect on the thought that the Company’s motto “Concordia Parvae Res Crescunt” (“In Harmony Small Things Grow”) might just as well apply to London Historians! There are much nicer photos than mine of this event on LH Member Andrea Liu’s Flickr album, here. Livery Halls are one of our main themes of 2015. The idea is that we’ll visit at least one a month. Next up is Cutlers’ Hall on 24th February. You can book places via Eventbrite here. The modern Guildhall Art Gallery opened in 1999. It’s a place I’ve always enjoyed visiting, whether on an opportunistic pop-in basis or for special exhibitions. To mark its fifteenth anniversary, the gallery has just undergone a comprehensive rehang and general update which has included a brand new LED lighting system and reclamation of wall space through the installation of false walls in the main upstairs space. This houses the Victorian paintings which are now rearranged thematically: beauty, faith, leisure, love, work, the home, and so on. More than this, the themes are arranged in pairs in a dichotomous fashion, e.g. Leisure and Work. This may seem quite an obvious thing to do, but a lot of thought has gone into this. A lot. I can’t explain it particularly well, it’s something you have to appreciate with your own eyes, but the result is delightful and gives the viewer a real sense of Victorian lives and living. 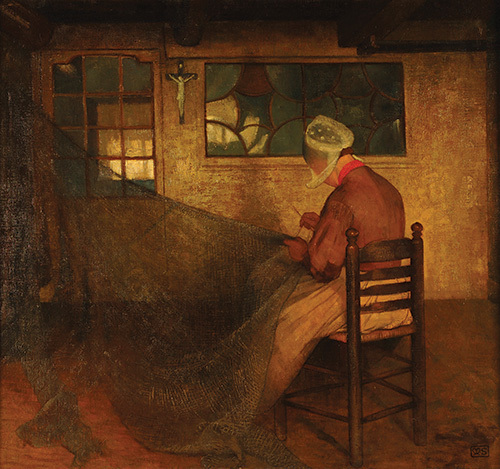 The Net Mender by Marianne Stokes, 1901. Downstairs to the London space, which spans 400 years, the earliest image on display being a portrait of one of the “fire judges” from 1667. This is just one of the 22 originally commissioned. 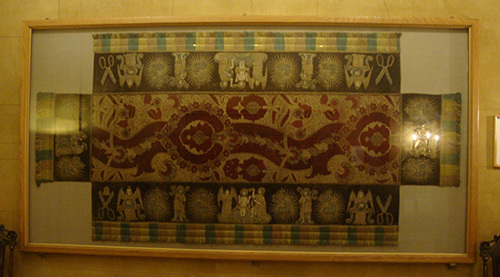 The curators have cleverly arranged the pictures so that each successive image is linked in some way. There are two arrangements which I found especially pleasing. At one end of the main gallery, the wall next to the stairs features five pictures of London’s historic markets, including Smithfield and Billingsgate. 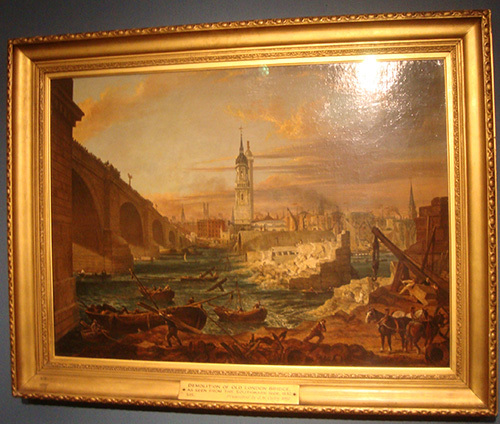 And then there are three images which feature old London Bridge, its successor and the two of them together during construction. Below are my not very good snaps, but you get the idea. Lovers of London’s bridges (that’s all of us, right?) cannot but be charmed by this trio. 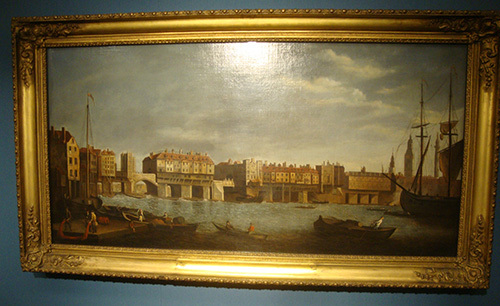 Old London Bridge, from Southwark with Boats and Figures. date unknown, before 1793, after Samuel Scott. 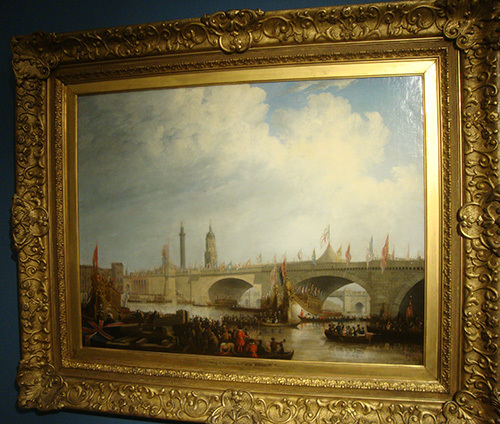 The Opening of London Bridge by William IV, August 1st 1831. 1832 by Clarkson Frederick Stanfield. The new hang is thoughtful and thought-provoking without being showy or over-clever. Principal Curator Lucia Dudkiewicz and her team have succeeded in breathing new life into an already wonderful collection. £600,000 once every 15 years for this purpose seems to me a canny investment. The Guildhall Art Gallery is open seven days a week. Entry is free. The gallery’s special exhibition celebrating the 120th anniversary of Tower Bridge is still running: don’t miss it. Our review.